Like Mac vs. PC or Playstation Vs. Xbox, there’s always been a flame war between propane proponents and charcoal enthusiasts. Owners of a charcoal grill say they choose charcoal for that traditional, slow-smoked Southern barbecue flavor. Propane grill owners love saving money on their clean-burning fuel, have more time to spend with family or guests because of the convenience of cooking with propane, and claim propane doesn’t withhold any of the flavor charcoal enthusiasts claim is only possible by cooking with charcoal. The argument is so ubiquitous that it even appears as a constant theme in the popular TV show, “King of the Hill.” Not as well-known is the argument that divides the army of charcoal-only consumers – lump charcoal vs. briquettes – and neither side is willing to capitulate. Purists love lump charcoal because this is charcoal in its most natural form. It is made by burning wood in the absence of oxygen and does not include any chemical additives. 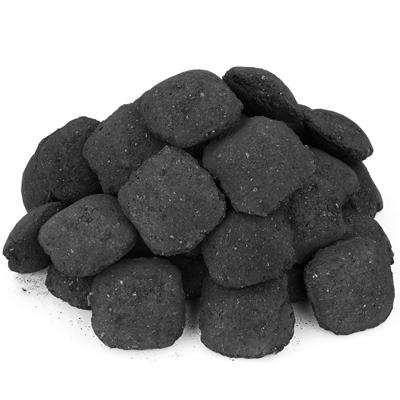 Lump charcoal also lights faster than briquettes, burns hotter, and leaves little ash. It is produced in an environmentally sustainable manner through the technique of coppicing. Cleanup is also a breeze when grilling with lump charcoal, as it leaves very little ash. Many fans of lump charcoal who own a grill with adjustable air vents claim it is easier to control the fire’s temperature, as it is more responsive to oxygen. 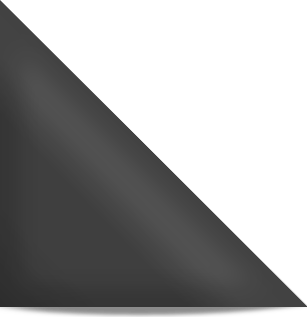 Lump charcoal can be used in any charcoal grill and, for a variety of reasons, is the recommended type of charcoal for use in a kamado-style grill (like the Saffire Grill). The size of lump charcoal is inconsistent, and while some brands are more consistent than others, all are less consistent than briquettes. Because of this, it is best to find a brand you like most and stick with it. Utilitarian grillers tend to prefer briquettes. They’re relatively inexpensive, you can find them anywhere, and fans of briquettes claim they’re easier to maintain a consistent temperature for longer periods of time because of how long they burn. Briquette fans also swear by the uniform size that is unique to briquettes, while lump charcoal comes in a random range of sizes, some of it being too small to be used for grilling a meal. 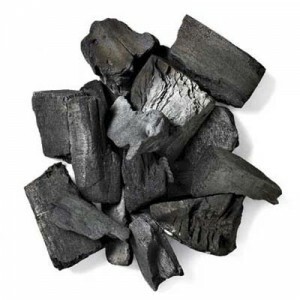 In response to lump charcoal fans’ claims that briquettes produce a chemical odor when lit, the smell dissipates once the coal is covered in a white ash. Proponents of briquettes claim that before the coals are covered in white ash, they aren’t ready for cooking food anyway. On the other hand, briquettes are made from by-products of manufactured wood and with chemicals to help them light easily or burn consistently, are compressed into their recognizable shape. These chemicals give off an odor when lit. Manufacturers often do not list these chemical ingredients. Because briquettes do not respond as well as lump charcoal to the introduction of oxygen, and because there is risk of briquettes imparting a chemical-like flavor to food, they are not recommended for use in kamado-style grills. While briquettes are relatively inexpensive and more user-friendly than lump charcoal, they can take approximately 30% more time to light. Clean-up is also more of a chore when using briquettes, as they leave ash at slightly under half of their original volume.